After my very helpful, Pupillage Advice# 1 which was about stamping out the "ums and ers"
I have more pupillage advice for you all. The Bar is obsessed with shoes so I am told. When I wore what I considered my nicest if not slightly knackered pair of Hudson's woven black leather shoes to my moot last Wednesday I was informed there after that I should have polished my shoes and infact that I needed new ones. I was slightly annoyed as I thought my shoes were fab, obviously not, despite the fact that I had polished them too..
P.S Could BarBoy Please invite me so I can read his blog? A good pair of boring black Oxfords or brogues would be money well spent. On a budget, go for Loakes. On far less of a budget, head for Cheaney or Churches. If possible, get a leather with a bookbinder finish. It looks nice and shiny even when merely wiped over with a dish cloth, and gives the impression that you're the sort of top chap who spends hours polishing his shoes. 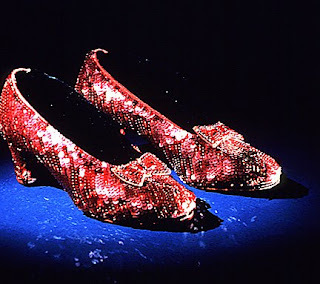 Good advice from BB, there Lost - a good, well cared for, pair of shoes, in tandem with a decent suit and crisp shirt doesnt half make a chap look the part, though I do agree that the Ruby Slippers would probably be more fun! If we're heading into general sartorial tips, stick to plain colours, wool, cotton and silk. Avoid stripes, checks, spots and anything with flowers. Otherwise, the very best you can hope for is that people will think you are an estate agent. At the worst, they will think you are an estate agent who has been dressed by his girlfriend/wife/mother. I like Brogues :) I shall invest in a pair!! I have been told always to wear a white shirt whilst mooting, and wearing a three piece always makes you look a bit smarter!! Know I shall try and find some suit trousers that allow me to wear braces! Hey Bar Boy, wazzup? Wherezya gone? If I promise to be nicer to you in the playground and stop nicking your dinner money will you let me into your blog too? I completely agree that a good pair of Oxfords or brogues are the way to go. They look very smart and will last a life time (however this will require polish and the occasional visit to the shoe repairers to get new soles). If you are on a budget I would recommend having a look in Jones The Bootmakers. Their sale is excellent and a good pair of smart shoes in the above mentioned styles can be picked up for around £45. I would also recommend investing in a pair of wooden shoe trees. They help your shoes retain their shape and draw out any moisture keeping the leather in tip top condition.